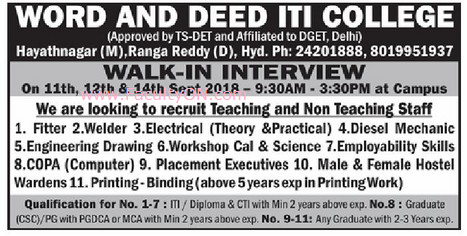 Word and Deed ITI College, Ranga Reddy has advertised in the EENADU newspaper for the recruitment of Teaching Faculty Plus Non-Faculty jobs vacancies. Interested and eligible job aspirants are requested to walk-in on 11th, 12th and 14th September 2018. Check out further more details below. About College: WORD AND DEED PRIVATE ITI, a Project of Word and Deed India, Certified Technical Educational project having more than 17 years of experience in imparting quality Technical Training in Industrial and Vocational education. It is dedicated for imparting the much in demand skill development, job oriented diploma/ certificate courses in Technical field. It is backed by a Corporate / Industries / Companies and Educational groups with expertise in imparting quality education and training. ITI / Diploma & CTI with minimum 2 years experience for the position fitter to employability skills | Graduate (CSC) / PG with PGDCA or MCA with minimum 2 years experience for COPA (Computer) | Any Graduate with 2-3 years experience for all other posts. How to Apply: Interested and eligible candidates are requested to attend the Walk-in interview with CV, originals & copies of certificates and recent PP size photos to the walk-in address mentioned below.